My 15-year-old son and I have been out Christmas shopping the past couple of weekends and had a blast. The coolest item that we came across was a home automation controller used for home theater rooms and more. More on that in a bit. We spent about 7 full hours browsing over the course of both days. Q: How many presents (for other people) did we buy, in total, on both trips? Why didn’t we buy anything? Visit electronics stores to play with all of the flat-screen TVs, blu-ray players, surround sound systems and game systems, of course. Visit most of the sports stores to play with the Air Soft guns and also to see how long it would take before they kicked us out for messing around on all of the exercise equipment. We got a great workout in the process. Cruise (literally) through Bed Bath and Beyond looking for gift ideas for the girls in the family. We ended up getting a quick massage by sitting in those really awesome chairs… then we left. Although, we did manage to gather one great idea for my daughter. Shhhhh! And then we hit the motherlode! The best part about Games and Things was the huge media room with two remote-controlled, leather reclining chairs inside… oh yeah! There was also a high-definition projector with a 120-inch screen paired with a sweet surround sound system. Everything in the room (except the chairs) was controlled by the Prodigy PMC2+ home automation controller system. One more thing, the ceiling had a custom celestial paint job. Very cool! We hung out in the media room watching Avatar for a little while. It was so great that we went back the following weekend and did the exact same thing. That’s what I call bonding! The Prodigy home automation system consists of two components, but can be made to be much more flexible by adding different components to control them all with the touch screen remote. Tate, the sales manager at Games and Things in Kennesaw, Georgia was telling me how versatile the remote could be. The basic system consists of the PMC2 media controller and the PTX3 handheld touchpanel. Those two components will run you around $1,200. This is an RF-based system which means that you can be anywhere in your house and it will communicate with the control box. It is not a line-of-sight type of system like most TV remotes. That is one of the awesome features of this unit. You must be within 100 feet of the controller or you can add plug-in expanders to extend your range an additional 50 feet, and so on. They simply plug in to any electrical outlet. Done! The RF transceiver is a 2-way RF and operates at 2.4 GHz ISM Channels 11-26 (2400 to 2483.5 MHz), default channel 15. The system is IEEE 802.15.4 compliant. The Prodigy controller can be used to check lights in your home, dim them, turn them on and off. You simply replace your light switch with the P-DIMEX wireless dimmer or the P-SMEX wireless switch. Lamps can also be controlled by the Prodigy system with the P-LDIMEX wireless lamp dimmer or the P-LSWEX wireless lamp switch. Application Guides: This will help you with placement of each add-on component and gives suggestions. Installation Guides: The system comes with a software suite that gets you set up in no time at all. No need to call an installer. You can also control all of these functions with the handheld touchpanel, iPhone or iPod Touch from around the globe. Yep… it’s true. Did I mention there are no cables to install? 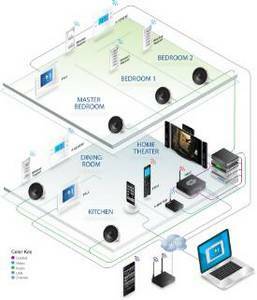 This is the system to have if you are going all out for your home media room. Sources and photos via Games and Things and Crestron, maker of the Prodigy system. Paint the ceiling of your room to resemble the stars in the night sky. Hire a professional to paint the stars and constellations in your media room.